When the weather just puts me “off”, I get grouchy, sleepy, and feeling out of sorts. But it also seems to do something internally alien to Comet and Dexter. Gas. It sneaks out of the black form curled up near my writing desk. 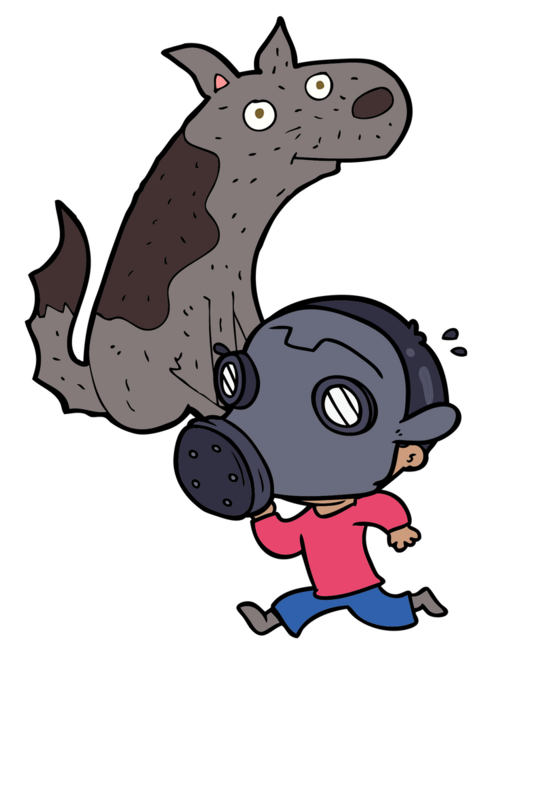 Though the Geneva Convention specifically prohibits the use of toxic gas between nations, no one monitors dogs. Now I understand that dog-owners, myself included are somewhat immune to the odors of a dog. (Go to anyone’s home that never has had a pet in it and likely the stark “clean” will irritate your eyes and throat). So last night, my wife – who sits at her desk across from me in our “office”, is totally focused on a project. As am I on mine. Dexter is sleeping at her feet. And almost as an aside she says, ” Oh my. Somebody let go. Brace yourself.” Strangely, we both consider the gas-passer is Comet and not Dexter. So how is it that I was now holding my breath? My oxygen-starved brain is clawing for answers. I am still searching for answers as the air clears. I had just taken the dogs on a vigorous evening walk. Both dogs had an opportunity to mark everything within a few blocks. And did so. Perhaps they ate some spoiled canned food? Both ate the same brand for at least a week. And neither one’s’ appetite has been affected. Or are they such California dogs, that it is the change in the weather?! It went from hot and bone-dry a week ago, to the floodgates of Heaven on Tuesday. As everything starts to dry out it was muggy. Until the “foul” weather passes, gassy treats for the animals, and people-food of the sort of gas-generating greens, chilis, and beans, especially beans, are banned at my house. And to save me another night from whatever crawled up inside the dogs, I may have to relent about my candle -phobia and have a scented one going in every room.